Obverse: Diademed male bust facing right with candelabrum to the front, within border. Reverse: Cross potent, pellet at each angle within two borders of dotted circles. Text around WV[NEE]TON. 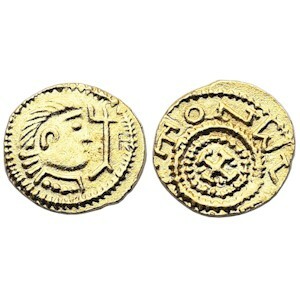 History: Wuneetton type thrymsas are derived from the Witmen type thrymsas and were minted around London and Kent. There are only six other recorded Wuneetton type thrymsas and the original of this coin was found the furthest West and is of a unique sub-type, due to the pellets at each angle of the cross on the reverse.